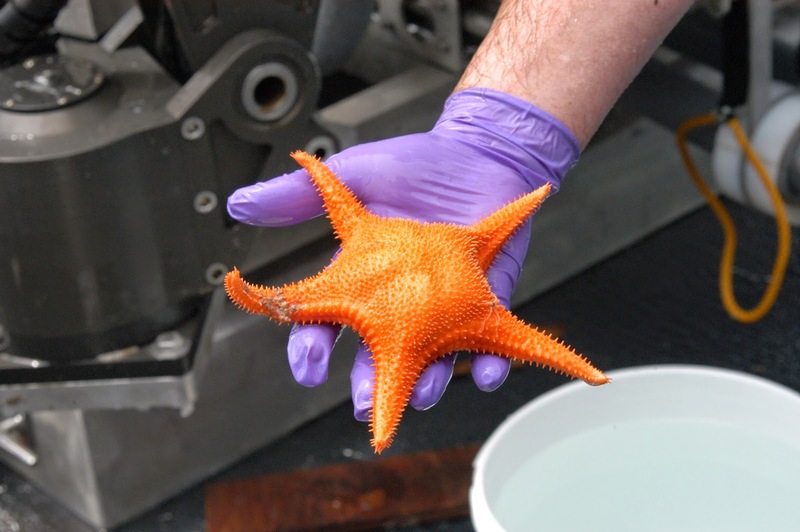 The Echinoblog: Okeanos Explorer,Evoplosoma and the North Atlantic Starfish Coral Predators!! 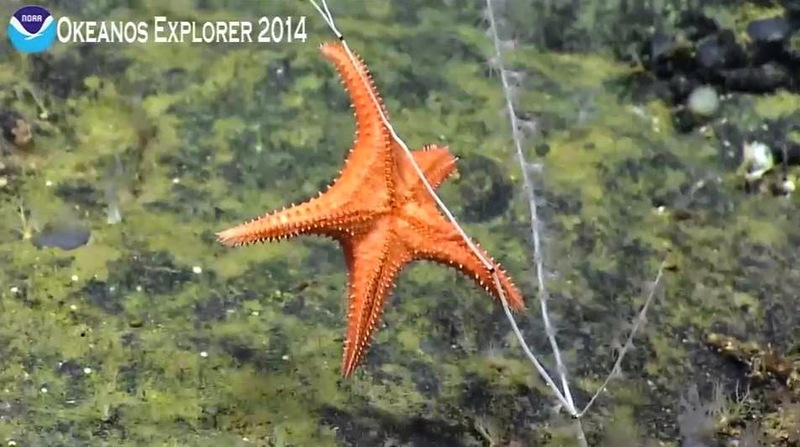 Okeanos Explorer,Evoplosoma and the North Atlantic Starfish Coral Predators!! This week, a bit of a break from my work in Japan to blog about my NEW paper!! 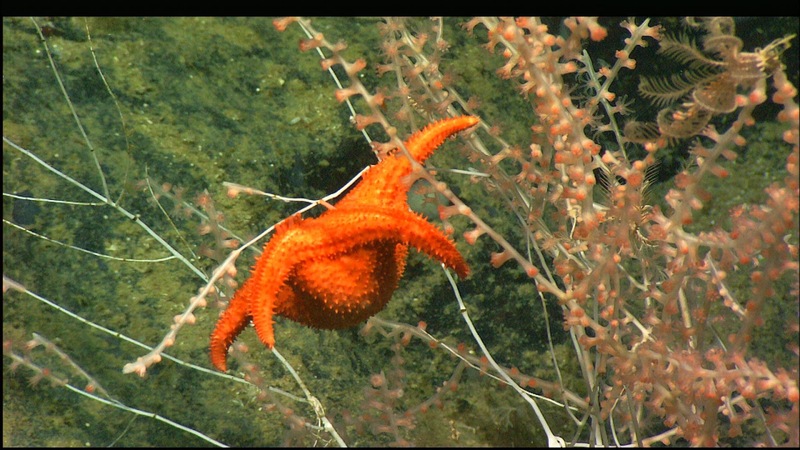 Its a little something I've published in Marine Biodiversity Records focusing primarily on the deep-sea coral devouring starfish Evoplosoma and some of its relatives in the family Goniasteridae! The paper is noteworthy because it uses actual images and data from the Okeanos Explorer research and outreach cruises operated by NOAA. I've made a point to mention how I've data mined the OE photo archives for some great deep-sea biology (here). And many of the images below are no exception. but there were several that occurred well before I became more deeply involved. It often takes a taxonomist (or any scientist) who has become SO familiar with the subject animals that you can recognize when something is new and something is old and rare.. sometimes from plates and figures that are over 100 years old! Ya see how the stalk with starfish is barren? and the "healthy" branch to the right still has tissue and polyps (i.e feeding structures) on it?? We're seeing feeding by the sea star which digests that tissue off the white center stalk.. These types of observations have only recently been more frequent in the last few years.. So, everyone "sees" these observations on the expeditions. But what most folks don't realize is that this is SCIENCE IN ACTION. Observations and data being recorded while they are watching the live stream! This blog post and the paper are the FORMAL RESULT of these pictures and video!!! The science entered into the formal record. Lets see what we've got!! 1. 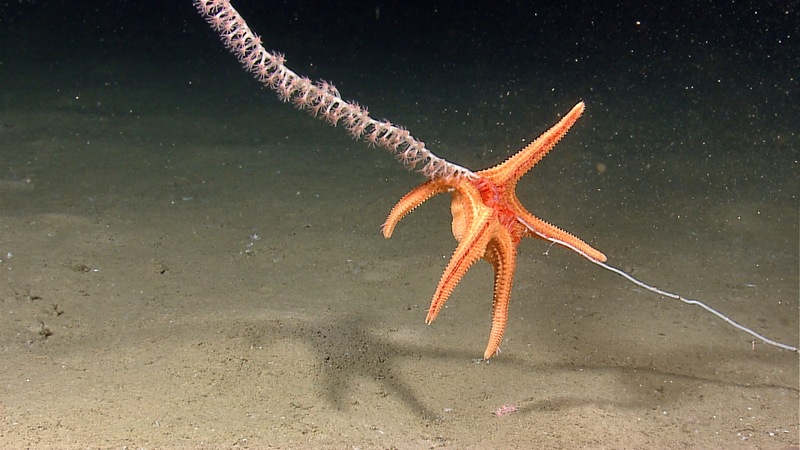 Some deep-sea seastars will feed on deep-sea "corals" for at least a YEAR! or more! 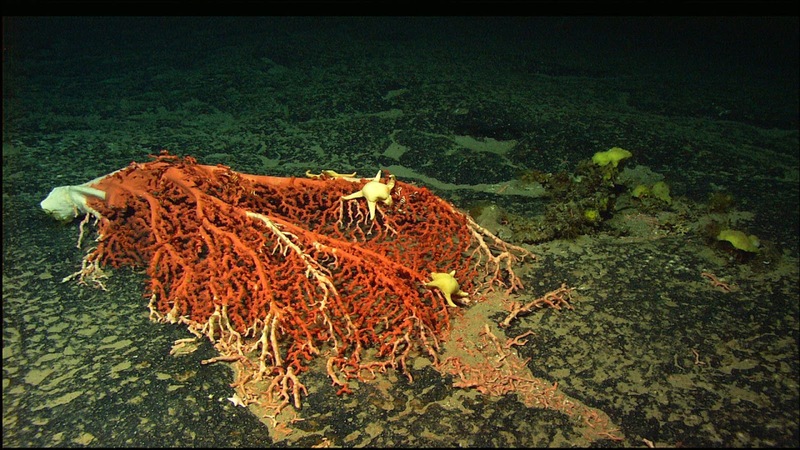 So, one cool thing I came upon during my providing "scientist on shore" input for the Okeanos Explorer live streamed expeditions was an anecdote by Dr. Scott France, who mentioned seeing a piece of "bubblegum coral" (not a true coral, but an octocoral called Paragorgia) on Manning Seamount in the North Atlantic, which had been knocked over at some point and was being fed upon by some sea stars, which at the time were unidentified.. The colony was still "alive" but being slowly fed upon by the sea stars!! Almost 15 MONTHS later! The feeding rate was incredibly slow compared to those measured in shallow water coral predators such as the Crown of Thorns (Acanthaster planci). Lots of thoughts and comments have probably jumped into my head and probably yours as well. "Are you sure those are the same four (three) sea stars?" "Couldn't they have moved on and come back?" "Did they REALLY stay there, eating a coral for a year?" 2. 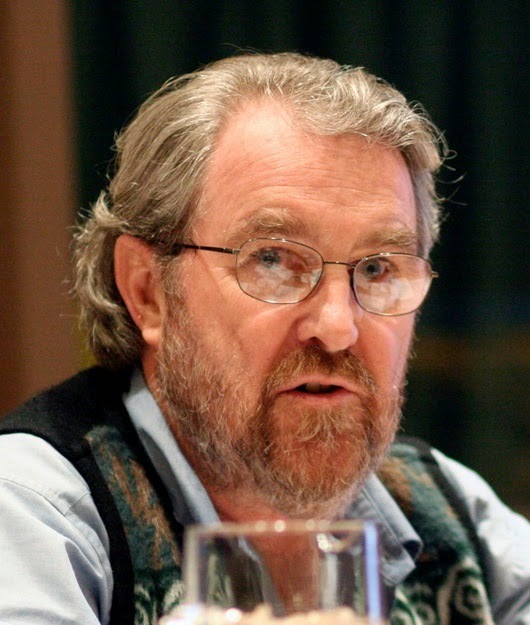 A new species of Evoplosoma, a coral devouring sea-star is named after its discoverer, Dr. Les Watling (University of Hawaii & University of Maine) !! 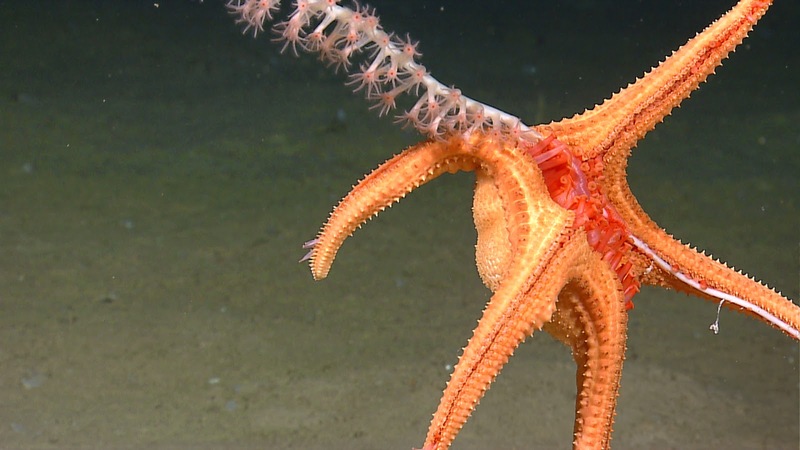 During an expedition to Bear Seamount in the North Atlantic in 2004, Dr. Les Watling spied this sea star, apparently feeding on the deep-sea corals he works on. That's where I come in! A few years later, I'm working on this group and examine the specimen he collected now over a decade ago! and voila it turns out to be a new species! This lag in discover to description is not unusual. As I've mentioned in a prior blog post, it can take OVER 20 YEARS for a new species to be described following its discovery in the field!! And..thus behold the new species Evoplosoma watlingi! Named for its discoverer!! 3. Evoplosoma feeds on coral in a very particular way... what are all those spines and pedicellariae for anyway? 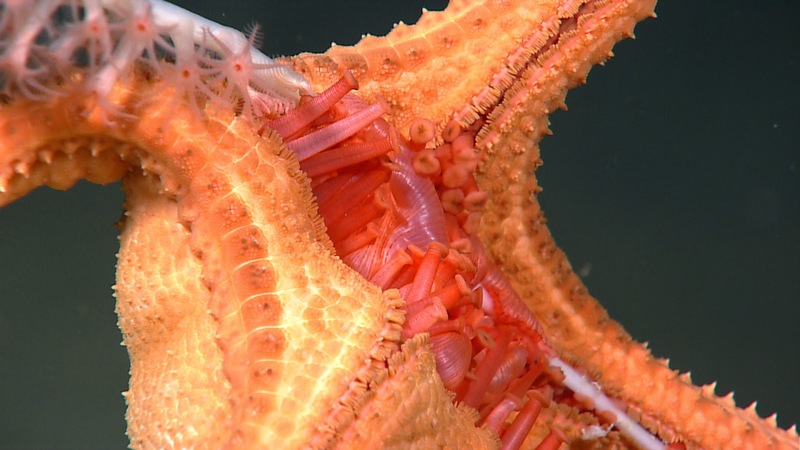 Everyone seems confident in assuming that sea stars feed in the same way.. that is, hump over the shell of a clam and extrude stomach into the crack and feed away, right?? Well, in coral-feeding sea stars we see a fine bit of acrobatic action involved!!! And thanks to the high definition videos of Okeanos Explorer, we can see them in VERY fine detail! 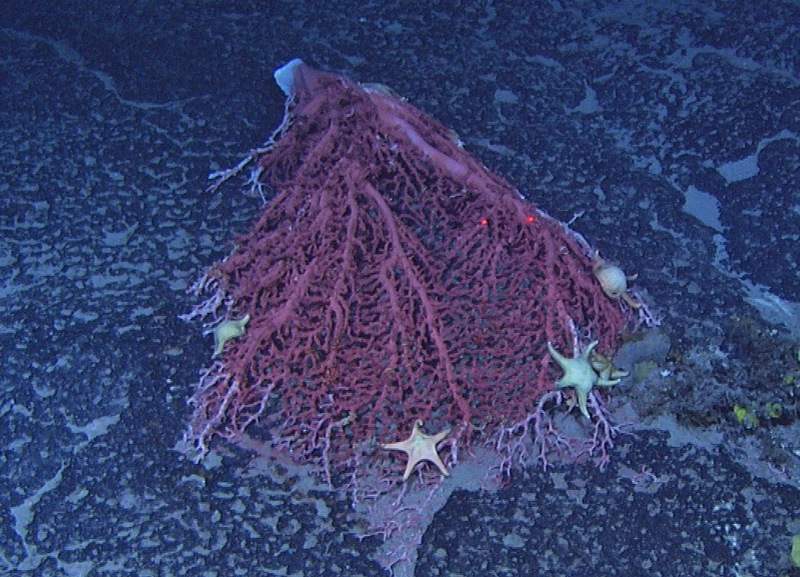 Basically, what's interesting about this and OTHER pics of these animals is how such a big, bulky animal seems able to effortlessly CLIMB up into the branches of these deep-sea coral colonies in apparent defiance of gravity! They can use those fancy, adhesive tube feet to climb up any surface!! Other surprisingly common features on these animals? Spines... and little claw-like structures known as pedicellariae. Are these used to help feed and climb??? Specimens are still necessary for the "nitty-gritty" biology. New species, etc. You CAN observe behavior and with a lot of sophisticated high-def video, you can even identify some of the critters you are watching! There's a LOT of video nobody has been watching with a TON of good stuff in it!! You can make a paper out of it! The crews & team members of the Okeanos Explorer and at NOAA for the support and help! Kate Neill, from the National Institute of Water & Atmosphere (NIWA) in Wellington, New Zealand! Marc Eléaume from the Museum national d'Historie naturelle in Paris, France and Scott France at the University of Louisiana! As many of you know, I am a big fan of the Okeanos Explorer Program and have summarized highlights from many of their dives! Here are some of them again! and here's more Evoplosoma love from the Pacific via the Monterey Bay Aquarium Research Institute from work I did back in 2010! !